How a Tata Nexon compact SUV owner got handling charges waived off; You can too! Handling/logistic charges are illegal in India. Yet, car and two wheeler dealerships routinely apply these charges on unsuspecting customers during vehicle purchases. A Tata Nexon owner recently contacted a dealer – Kamakhya Motors in Guwahati – for purchasing the compact SUV and was given a quote that included handling charges. Upon asking the dealership personnel to waive off the handling charges, he was told that he couldn’t buy the Nexon without paying handling charges. The customer then emailed Tata Motors’ customer care, marking CEO Guenter Butschek. 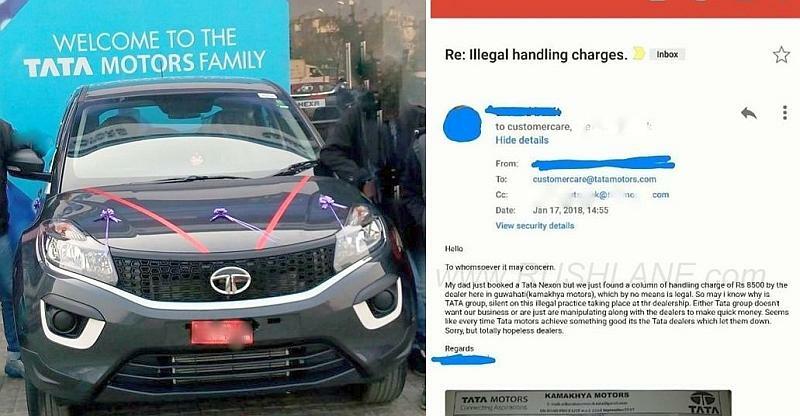 This escalation from the customer saw Tata Motors’ customer care division asking the dealer not to levy handling charges. The next day, the customer received a call from the Tata dealership saying that the handling charges had been waived off and that he could purchase the Nexon minus these charges. Dealers are still charging illegal handling or logistic charges. Booked a Nexon and found them to charging handling charges and as far as my knowledge that’s totally illegal to which I protested but they insisted that I pay have to buy the car. Wrote an email to customer care and the CEO of Tata Motors. And the very next day got a call from the dealer and are waived off the charges. So please spread the news and create some awareness on this illegal way of making quick money by the dealers. What to do when a dealer asks you to pay handling charges while purchasing a car/two wheeler? Like this customer who wrote to Tata Motors’ customer care, you can write to the car/two wheeler company, complaining about these illegal charges being levied by the dealership. Usually, this results in the car/two wheeler company asking dealers to waive off handling charges. Many buyers are unaware that handling charges are illegal, and end up paying large amounts of money as handling charges. In case of luxury cars, these charges can go up to Rs. 50,000, or even more.